If one of your teeth is damaged, or you think that you may have a serious cavity or an infected tooth, a dental crown might be the best way to restore your smile and protect it from further damage. At Fischl Dental Associates our dentists have the skills and expertise to create beautiful, natural-looking crowns that will restore the form and function of your smile, as well as your self-confidence. A dental crown is also often called a “cap.” This is because it surrounds and “caps” the entire surface of your tooth to protect the underlying enamel, dentin, and pulp from further damage and decay. Dental crowns are usually used to treat teeth that have been damaged due to tooth decay, or if your tooth has been cracked and damaged in an oral injury and a more conservative treatment like a filling is not suitable. How Are Dental Crowns Built And Placed? The process of crown placement begins with a comprehensive oral exam. Dr. Paul or Dr. Marie will examine your mouth, discuss your needs, and work with you to determine whether a dental crown is the best option for you. If a crown is an appropriate treatment, your tooth will be numbed and shaped to provide a stable, solid platform for your dental crown. Then, images of your mouth will be taken. At Fischl Dental Associates, we use CEREC technology to scan your mouth and get a 3D image of your teeth. The process is comfortable and efficient, and it only takes our dentists a few minutes to get the information and images they need. This information is sent to our in-house CEREC machine where your crown will be created by one of our dentists. This process typically takes about 30 minutes. Once your crown has been manufactured, it will be cleaned and checked to make sure it fits perfectly in your mouth. Your tooth will be cleaned and disinfected, and the crown will be permanently attached to your tooth using a strong dental cement. Finally, your crown will be polished and buffed to remove any imperfections, and the process is complete. The entire treatment can be completed in just a single 1-2 hour appointment under one roof, and you’ll leave our office with a new, beautiful tooth! 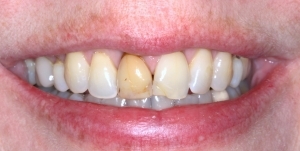 Are Crowns Only Used For Restorative Dentistry? While crowns are often used to protect teeth affected by tooth decay and oral injuries, they can also be used for cosmetic purposes. 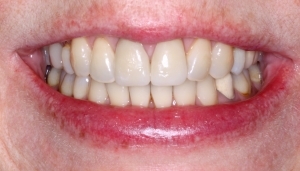 Porcelain crowns can treat teeth and cover up imperfections that cannot be treated with veneers. They can also be used to replace older dental work, like gold or stainless steel crowns. Whether you are interested in dental crowns for their restorative or cosmetic benefits, give us a call today to go over your options! Interested In A Dental Crown? Contact Us Today! Whether you’ve experienced an oral injury that has damaged one of your teeth, or if your tooth is infected and decayed, Fischl Dental Associates offers beautiful, protective dental crowns in Evanston. Dr. Paul and Dr. Marie are experienced restorative and cosmetic dentists in Evanston, and our team is always here to help. Schedule a consultation now by giving us a call at (847) 864-0822, or coming to our office at 636 Church Street, Suite 200 W, Evanston, IL 60201.